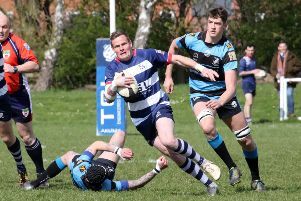 Banbury Bulls ended Old Patesians’ unbeaten record in Wadworth 6X South West One. Matt Goode’s side produced a brilliant defensive display to beat the leaders, who had won their last 18 games, 15-5 at the DCS Stadium. And it was player-coach Goode who returned from injury with a couple of outstanding tries in each half to propel his side to Saturday’s memorable victory. Ed Phillips kicked Bulls into an early lead after Old Patesians were penalised for coming in at the side of a scrum. That came after a sustained period of pressure in the visitors’ half as Bulls flew out of the blocks in front of a bumper crowd. Goode made the breakthrough when Bulls won a scrum five metres out. Phillips found Sam Stoop and he released Goode who smashed his way through and dived over by the posts. Phillips converted before Darren Moore picked up yellow card just before halftime. Old Patesians started the second half strongly and were camped in Banbury’s 22. Despite some great defending from Bulls, Old Patesians found their way through. Steffan Morgan made a great run before expertly off-loading to Lee Hathaway who dived over in the corner. But James Aherne was unable to add a difficult conversion attempt from out wide. Bulls responded well with Chris Phillips impressing and Jack Briggs nearly scored after a great break from Tommy Gray but was stopped just short. Pete Boulton made a good run before off-loading to Briggs who was stopped in the corner again. Old Patesians handled the ball on the floor resulting in a penalty which Phillips kicked for touch. Ian Isham found his target in the line-out but the maul was pulled down immediately. Bulls would not be denied, Phillips and Stoop combined for Goode to pick his way though the Old Patesians’ line expertly before diving over for his second try. Phillips struck the post with his conversion attempt. Old Patesians desperately tried to get back into the game, producing their best rugby of the contest, but Banbury’s defence was equal to it. Old Patesians won a penalty in the final minute but Aherne’s kick drifted wide and that was that.